On Saturday, I swang by the Schaumburg, IL public library for a mini-comic-con they were holding. They had about a dozen creators (Scott Beaderstadt probably being the most famous), two vendors, some face-painters, a variety of professional cosplayers (including members of the 501st), and a decent-sized display of historical comics presented by a local comics fans/historian. 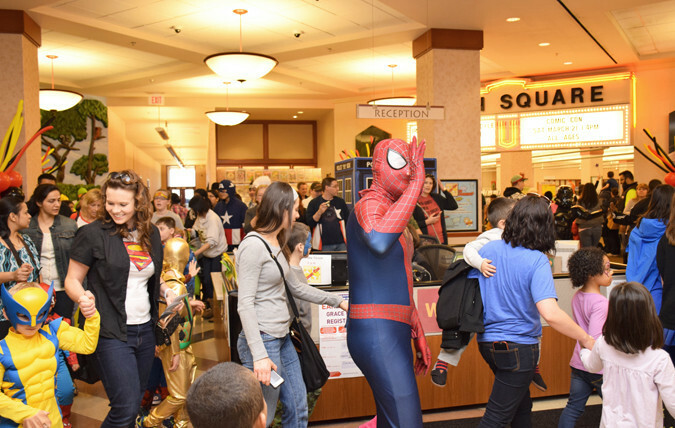 There were a few panel presentations and a "superhero storytime." The last library comic con I attended in Elgin had many of the same types of things and was about the same size, but it was was a very different type of show. The biggest, most noticeable difference was in the layout. That previous one I attended had all of the activities besides the panels in a single room. Much like how you're used to seeing at a comic convention. This weekend's, however, had the show spread out over a sprawling chunk of the library. The cosplayers were centrally located in the reception area, the Artists' Alley was over past the A/V equipment, the vendors were at the front of the children's section, and the face-painting was in a separate room beyond that. Scattered throughout the library were various comic character standees (Superman, Spider-Man, Olive Oyl, etc.) and someone had set up a good-sized Batman display in one of the alcoves. The library had hung "Pow!" and "Zowie!" type effects on the walls throughout, and most of the librarians I saw were wearing capes. I haven't been able to figure out which approach is better. I certainly liked the consolidated approach of the Elgin show better myself, and I heard more than a few people at this weekend's event who were complaining that they couldn't find what they were looking for. The show seemed disorganized with creators and vendors just kind of dropped wherever there was a few square feet of space, with seemingly no regard to traffic flow. (Indeed the line for the face-painting wove back through the library, completely blocking off access to the two vendors.) Other patrons who didn't seem to be at the library for the show struck me as irritated that they had to deal with the crowds. However, by spreading the show throughout the library, it forced visitors to check out several different sections of the library, perhaps bringing them into contact with areas they might not normally visit. Given that the standees seemed spread out well beyond the areas where the "main" portions of the show was taking place, and that librarians were caped regardless of where they sitting, I suspect this was the intention. I'm not familiar enough with that library building to know if they could have housed everything in one room, but I saw at least one corner with several large-ish rooms that could have "confined" the convention to a only a portion of the library preventing the congestion that cropped up in several places. I suppose the ideal, from a librarian's perspective, would be somewhere in the middle. Having a set-up where visitors are encouraged to walk through multiple portions of the library, but without disrupting the regular flows of traffic. One of the perennial complaints I seem to hear about larger, "professional" shows also frequently boils down to traffic issues. But they have the advantage of A) a more malleable space that's expressly designed for events like these, and B) a considerably larger budget with which to have people dedicated to addressing traffic concerns. Libraries, by contrast, have the constraints of A) a crudload of essentially unmoveable furntiture loaded with books and such that restrict traffic patterns already, and B) being fiendishly understaffed and underfunded. Given that, I'm not about to say that Schaumburg shouldn't do a show until the sort out any traffic concerns but, speaking as a third-party participants, I definitely like the approach that just encourages reading and doesn't try to showcase the pretty building.